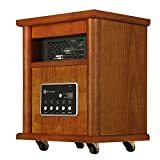 Homegear - Infrared Electric Portable: Space Heater • The Air Geeks, reviews of air conditioners, dehumidifiers and air purifiers. This Infrared Electric Space Heater is Homegear’s solution to colds and coughs during the chilly months. They offer a safe approach for homeowners to get enough heat to warm themselves and the house without having to dig deep into their pockets. If you are looking to adventure into the world of infrared heaters, you are in the right place. We are going to dig into this appliance’s features and by the end of this buying guide, you will be prepared to decide if this is exactly what you are looking for. So, let’s get straight into the meaty stuff, will we? If you are new to infrared technology, we’ll give you a head start! Infrared heaters work by producing heat similar to that of the sun. This toasty heat is usually at the healthy range of 9-14-micron meters. The heater uses a dual heating system whereby it relies on direct heating with 4 different quartz heating elements to enable it to produce enough heat more efficiently. Some of the heat produced by this heater goes directly into our bodies and therefore the result is an instant, economical, healthier and environmentally-friendly way of producing about 1500W of heat enough to power a medium to large space. A powerful fan is included to help in distributing the heated air evenly across the room much faster than oil-filled counterparts. This heater also comes with some high-end safety features. One of these is the overheat protection feature that ensures the appliance’s internal components do not overheat as this can cause fires or damage to the fan and the heating elements. Another useful safety feature is the automatic tilt or topple detection switch that turns the device off in case it is knocked over. Without it, the intense heat from the appliance can damage the floors or start fires if the front face falls come into contact with flammable objects. The exterior is covered by wood, which makes it safe to touch and handle with bare hands. It also has passed the UL Certification’s clean bill of health. A digital control panel consisting of a thermostat and a 3-level heat-setting enables you precisely set your preferred heat. The LED display enables for easy monitoring of the current temperatures and facilitates setting your preferred temperature via the thermostat in a hassle-free experience. Of course, the high mode is the quickest way to attain your desired temperatures at 1500-W of heat output. The remote works as far as 15 meters/50 feet away to help you adjust the settings without having to leave your sofa. An eco-mode is an alternative especially if you want to save in your electricity bill. It automatically configures the setting to maintain the room temperature at 68F. A timer allows you to set up to 12 hours of operations after which the appliance shuts itself off. The low power mode is capped at 750W. The inclusion of a blower fan means the appliance won’t be completely quiet though it manages to significantly suppress the noise produced by the heater. The low heat setting would be ideal for bedrooms or if you need to study or watch TV. At 16 lbs and a height of 16 inches means the appliance is completely portable. In fact, the heater is fitted with 4 multi-directional caster wheels that enable you to relocate it from one place to another with ease. Although, t takes a bit of space compared to other competing appliances, it has a width of 10in by 12in, we think its worth it. Heating levels 3 heat settings (750W, 1125W, 1500W), Auto mode. Comes with a remote: Enables you to configure the setting from as far as 15 meters or 50 feet. Quick and efficient: The dual heating system ensures fast heat production and even distribution. Can't share an outlet: It blows fuses the outlet if it is shared with another appliance. Fast Shipment and the product is very nice. It throws a decent amount of heat but its hard for me to judge since my place is poorly insulated. I use it in a small office and it definitely helps keep it warm. The heater is very light and easy to roll around and even lift-to-carry to a different room. The cord could be a little longer, its about 5 feet but it works for my needs. Overall I would recommend it as a good heater." It has lasted longer than any other space heater we have purchased. It started out extremely quiet, we barely knew it was on but has recently started to be a little louder but is still substantially quieter than others. We run it pretty consistently which is probably the only cause. It's easy to clean and the control panel is nice." As per our analysis, we feel this heater is a worthy investment. Not many space heaters are able to accommodate so many features at this price. The dual heating technology is very effective in providing instant and effective heating solutions. The company decided to go with 4 quartz elements as they enable more powerful heat production as well as ensuring that a defect with one element does not affect the whole appliance. This is definitely a perfect addition to any home and it will help you make your winter more bearable without setting you back financially.